There are at least 75 species of the genus Achatina. The shell of A. fulica is narrowly conic, up to 200mm in length although 50-100 is the average. The shell colour is variable but usually consists of alternating brown and cream (or white) bands. The body is browny-grey in colour. Smith, B. & J. Stanisic (1998). Superorder Pulmonata, pp. 1037-1125, in Beesley, P.L., Ross, G.J.B. & Wells, A. (eds) Mollusca - The Southern Synthesis. Fauna of Australian Volume 5. CSIRO Publishing: <?xml:namespace prefix = st1 ns = "urn:schemas-microsoft-com:office:smarttags" />Melbourne, Part B viii 565-1234pp. Abbott, T. (1989). Compendium of Landshells - A colour guide to more than 2,000 of the World's Terrestrial Shells. American Malacologists. 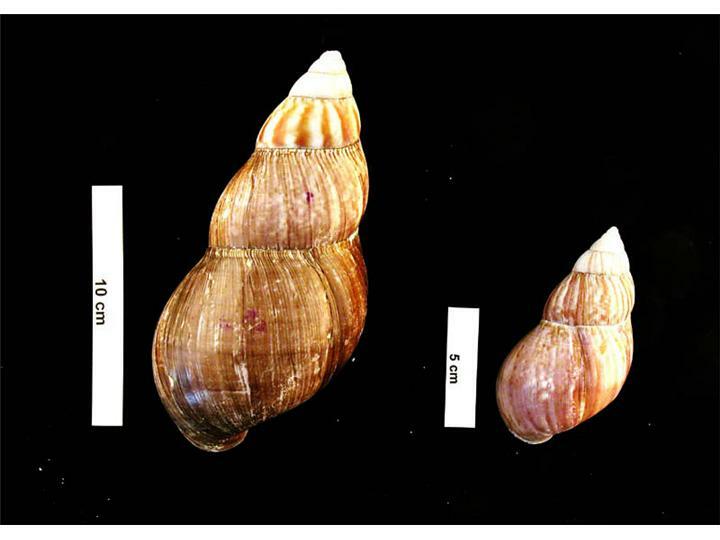 Walker, K. (2005) Giant African Snail (Achatina fulica) Updated on 10/21/2011 9:30:55 AM Available online: PaDIL - http://www.padil.gov.au.